In the Viceroyalty of New Spain, the Roman Catholic Church was an important—if not the most important—art patron, commissioning churches, altarpieces, paintings, and sculptures, a result of the system of Royal Patronage (Patronato Real), which granted the Spanish Crown unprecedented privileges in Church affairs in exchange for Spain’s funding of missionary ventures abroad (this was a unique system in Europe). The colonization of New Spain therefore worked in favor of both the Crown’s imperialist and material aspirations, and the Church’s desire to evangelize local indigenous populations. These goals were accomplished largely through the work of missionaries and mission churches, as well as through an active artistic program that initiated the construction of new buildings and art schools that trained Amerindians in the art of painting, sculpture, and even cartography. Royal Patronage also meant that colonial authorities exercised considerable power over the Church in New Spain, controlling church appointments, revenues, and architectural programs. The Christianization of the Americas began in 1537, following the papal bull Sublimis Deus, through which Pope Paul III declared that the native populations were in fact human beings with souls and the intellectual potential to understand the tenets of Christianity, and thus were not subject to enslavement (prior to this moment they had been considered savage and even demonic by the Church). This religious fervor grew even more severe in 1545, when the Council of Trent convened in response to the rising threat of Protestantism, a new form of Christianity that emerged in the sixteenth century as a reformed version of Roman Catholicism. In response to the Protestant Reformation, the Council of Trent launched a global campaign—known as the Counter-Reformation—that reaffirmed Roman Catholic beliefs and teachings. One of the results of this effort was that religious institutions like churches, monasteries, and convents were expected to play an active role in expanding their congregations and expounding the values of Roman Catholics through the proliferation of religious spaces. From 1523 to 1580, many religious orders arrived in New Spain, among them the Dominicans, Franciscans, Augustinians, and Jesuits. Determined to convert the native people and expand the congregation, friars built mission churches, also called conventos, in indigenous communities, such as the Franciscan Church of San Miguel in Huejotzingo (above) and the Augustinian Church of San Salvador in Malinalco (below). These mission churches, which followed a similar architectural plan but varied in terms of decoration, are among the earliest examples of colonial architecture—a testimony to the importance given to missionary work within the Viceroyalty of New Spain. A religious militia of sorts, the friars not only empowered the Church, but also facilitated the colonization of New Spain without the use of a standing army. Colonial maps like the Map of Oaxtepec reiterate the importance of mission churches. 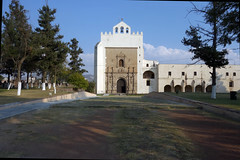 Here, the convento, identified by the large patio (courtyard), appears as the nucleus of the community. Near the edges of the map, and connected through a network of roads, the artist depicts seven additional churches. Their identical appearance suggests that they are meant as symbols for “church,” rather than visualizations of how these spaces actually looked. This repetition reinforces the firm presence and power of the Roman Catholic Church in New Spain. 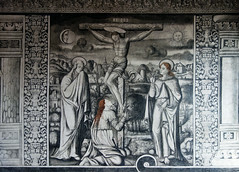 Franciscans were among the earliest monks to arrive in New Spain, including the three prominent Flemish Franciscans Peeter van der Moere of Ghent (a.k.a. Pedro de Gante), Jehan der Auwera (a.k.a. Juan de Aora), and Johan Dekkers or de Toict (a.k.a. Juan de Tecto). 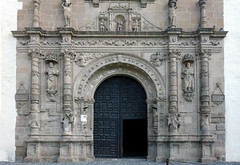 For monks, the first order of business was to begin construction on mission churches that functioned as “theaters of conversion,” as art historian Samuel Y. Edgerton refers to them, since they served as sites of theatrical performances and processions that merged both pre-Hispanic and Christian rituals. In preparation for this process of conversion, monks—particularly Franciscans—would learn the languages and cultures of the local populations, allowing them to integrate indigenous names, iconography, and customs into the Christian practices of New Spain. The most powerful of didactic tools, however, were visual aids that helped overcome the challenges of illiteracy and language barriers. 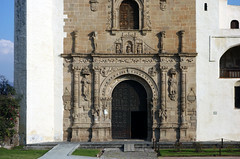 The exterior of the Franciscan mission Church of San Miguel in Huejotzingo serves as an exemplar of the importance of designing a proper space of conversion. Featuring high, thick walls topped by crenellations, the church appears—at least from the exterior—as a type of fortress. This design might have suggested the permanence of these Christian missions in New Spain. Monks came and went, but the church and its congregation remained. The design might have also alluded to the belief that Christian monks were the soldiers of God—though such associations might have been lost on the indigenous population. The convento was, in and of itself, a foreign concept. 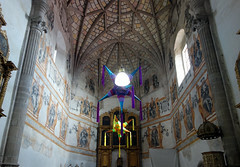 Therefore, the fact that these churches were built by indigenous masons and often times in an indigenous style helped to further legitimize the idea of the convento as part of their local community. 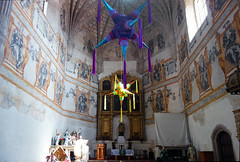 A unique characteristic of Mexican conventos was the creation of open spaces, like the capilla india, used to address large native crowds, and the smaller posa chapels in the corners of the atrium (typically found in Franciscan churches), used for ritual processions involving portable altars. While the creation of these outdoor spaces solved the problem of accommodating the growing population of converted Christians, it resonated among the natives who, during the pre-Columbian period, performed dances and rituals in walled outdoor spaces, recalling the open-air layout of the Templo Mayor in the Aztec capital city of Tenochtitlan. As was typical of Franciscan mission churches, the Church of San Miguel includes four posa chapels, each located in a corner of the perfectly squared patio. Above the archway, relief sculptures of angels appear inside a knotted cord, a reference to the habits of the Franciscan monks, who each tied a cord around their waist. Above these angels, four shields contain the emblems of the Franciscan order. The distinctive pyramidal roof is another common trait of posa chapels. 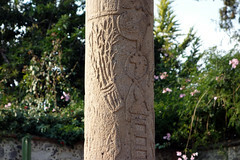 Found in conventos of different religious orders, atrial crosses were sculpted stone crosses displayed in courtyards, such as the one found at the Convento of San Agustín de Acolman. They usually represented the instruments of Christ’s passion in relief, thus avoiding the need to represent the actual Crucifixion. 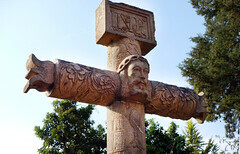 By avoiding a realistic depiction of Christ’s sacrifice, the early missionaries were intentionally de-emphasizing the existing ideas about human sacrifice prevalent in Mesoamerican cultures. 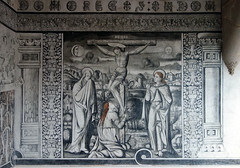 At the Convento of San Agustín de Acolman, one can also find a series of fresco paintings that detail the Passion of Christ through a narrative sequence. 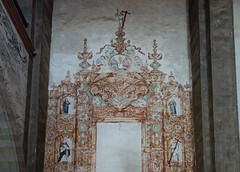 Indigenous artists, who were most likely looking at religious prints imported from Europe, created these frescoes, with their sparse composition and limited color palette. Much like the atrial cross, these murals functioned as didactic tools that gave visual clarity to an otherwise complex narrative, and borrowed from both Christian and native practices. 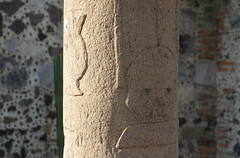 Carefully combining local and foreign practices, these mission churches created a unique colonial iconography and architecture that is indebted as much to Amerindians as it is to Europeans. While conventos served to first congregate and convert locals during the early decades of colonization, they largely fell out of favor by the end of the sixteenth century. Yet despite their demise, Catholicism continued to flourish in New Spain, and even after independence. Barbara Mundy, The Mapping of New Spain: Indigenous Cartography and the Maps of the Relaciones Geográficas, (Univeristy of Chicago Press, 1996), p. 79. Samuel Y. Edgarton, Theaters of Conversion: Religious Architecture and Indian Artisans in Colonial Mexico (University of New Mexico Press, 2001). Cite this page as: Dr. Maya Jiménez, "Mission churches as theaters of conversion in New Spain," in Smarthistory, October 9, 2018, accessed April 21, 2019, https://smarthistory.org/missions-new-spain/.